The story revolves around Dhruva ( Ram Charan) and Siddharth Abhimanyu ( Aravind Swami) where Siddharth After his graduation he returned to India and is now a well-established scientist. Siddarth uses the medical field for the wrong reasons and his own profit. Dhruva finds the detective mind of Siddharth Abhimanyu and tries to arrest him and Ishikha ( Rakul Preet Singh) romances Dhruva and helps him to achieve the goal. The cat and mouse game between Dhruva and Siddharth forms the rest of the story. Dhruva (2016) The story revolves around Dhruva ( Ram Charan) and Siddharth Abhimanyu ( Aravind Swami) where Siddharth After his graduation he returned to India and is now a well-established scientist. Siddarth uses the medical field for the wrong reasons and his own profit. Dhruva finds the detective mind of Siddharth Abhimanyu and tries to arrest him and Ishikha ( Rakul Preet Singh) romances Dhruva and helps him to achieve the goal. The cat and mouse game between Dhruva and Siddharth forms the rest of the story..
movie is an dhruva action entertainer ,here first half is an nice and ramcharan and his friends moive is an action ,seocnd half is an nice action ,movie dubbed also telugu here also good screen play is nice and direction make movie an good asset. dhruva ,movie is an nice action and music also good ,here dubbed movie from tamil in to telugu ,here first half is an nice action second half is an thriller moive to watch over all its an nice movie . dhruva moive is an nice action entertianer ,here movie is an dubbed also movie and here ram charan action is ncie and music and back ground beezem and director make good and over all its an action entertainer . On The Flipside The Runtime Is Lengthy And There Are A Few Scenes That Appear Dragged. Dhruva Is One Such A..
Apart From Few Minor Issues, The Movie Is Right On Track. Director Surender Reddy’s Slick Direction,.. The Film Is Receiving Positive Reports From The Audience But Is Not As Positive In B & C Centers. Considering..
Dhruva Is One Of The Most Awaited Movies This Year Which Is The Officials Remake Of Tamil Blockbuster Thani..
Dhruva Is A Stylish Cop Entertainer. Multiplex Audiences And Thriller Movie Lovers Will Enjoy The Film To The..
Watch This Film If You Are Fan Of Syrupy Romances Or Ranveer Singh’s Groupie. 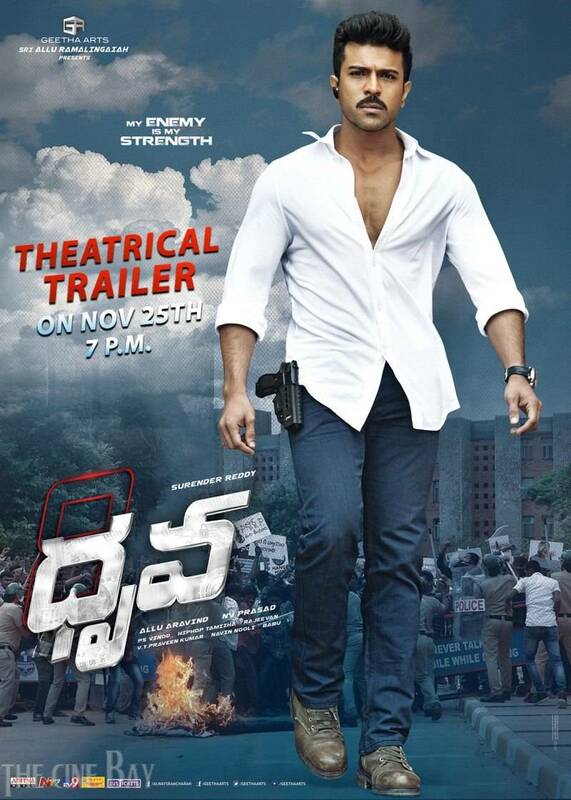 Otherwise, Jump Into This At..
'Dhruva' Is A Self-contained Remake With Excellent Characterizations, Arresting Episodes, Impressive..
. Telugu360 Rating : 3/5 Editor Rating Rated 3 Stars Good 60% Dhruva Movie Review Reviewed By: Krishna..
Dhruva Movie Salute To Audience..
Watch Surender Reddy On Dhruva..
Watch Dhruva Pre Release Function..
Dhruva Movie || Pre Release..
Talkie Portion Of Ram Charan..